Power- The power of a vacuum cleaner indicates how efficient the device is. It shows how efficiently it will remove dirt and dust from floors and carpets. 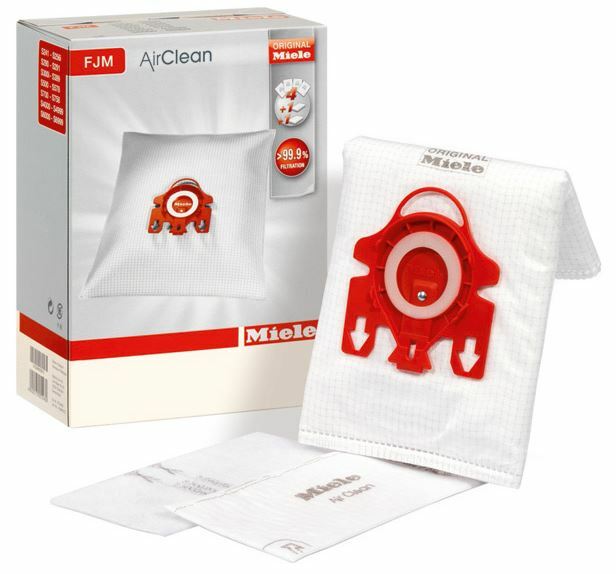 To order more Miele vacuum bags fjm click here. User-friendliness- People want their vacuum cleaners to be easily manoeuvrable and simple. Hygiene- A vacuum cleaner must have smell control features and must possess the ability to filter out irritants & allergines. Reliability- Vacuum cleaners must be durable. Every Miele hoover vacuum cleaner comes equipped with a 1200 W dual fan suction motor. As a result of having a motor system that carries two fans, the vacuum is capable of generating greater suction compared to vacuum that use suction motors with just one fan. The Miele devices rotate perfectly, which enables easy cleaning irrespective of the kind of cleaning job you are performing. What’s more, the company has made a few enhancements to its vacuum cleaner designs recently to provide the units with full 360° maneuverability. Another practical, but rare feature to most vacuums, while common in these Miele creations is the automobile cable rewinder. The newer models come with an additional feature, the ability to monitor the cord size instantly and keep adjusting it constantly based on your requirements. The next feature you will find in every Miele vacuum cleaner is called Park-system, allowing you to park tools while vacuuming and stop/start the vacuum when they are removed ready to use. These are very different from Henry Hoover Vacuums. When using a Miele vacuum, you will never get exposed to the dust, allergens and other unwanted elements inside the bag. When you remove the bag, it will close itself up. Blue Mountain Vacuum Center sells cleaners boasting a HEPA (High efficiency particulate air) filter. Every Miele cleaner features a HEPA filter. A HEPA filter boasts the ability to filter out as much as 99.97 percent of collected irritants and has a micron rating of 3. These filters come equipped with a thin charcoal layer, which allows it to control bad smell. The dual fan design of the motors found in Miele units increases the life span of those motors by protecting the motor brushes and ball bearings against wear and tear. These vacuums feature a specially designed heat sensing unit. The unit becomes active whenever there’s a blockage and prevents the machine from being overheated. Miele vacuum bags U and more vacuum reviews. Usually, Miele devices come with 1 year service warranty. However, that can be increased to Five years. To be precise, vacuum cleaners from Miele have managed to impress and satisfy users with three qualities, dependability, ease of use, and amazing filtration. We come across people who want to return their Miele vacuum cleaners very rarely; people contact us with return requests when they want to exchange their Miele cleaner with a larger version. To date, we have not received a single complaint regarding breaking down of a Miele vacuum cleaner early in its life cycle. It’s true that their prices are higher than the prices of vacuums manufactured by other companies; however, that shouldn’t be a concern for you as you will get true value for your money. Find the best handheld vacuum cleaners here. If you are one of those people who are not ready to compromise quality, the Miele Complete C3 Martin is a vacuum cleaner designed for you. It comes equipped with all features a five-star rated cleaner should possess. Go for this unit, if you are looking for a cleaner just for cleaning bare floors. For individuals looking for a device capable of cleaning both bare-floors and carpets, our recommendation would be the Miele Complete C3 Kona. People looking for an upright lightweight vacuum, should buy a relatively newly launched cleaner from the house of Miele. It’s the Miele Dynamic U1 AutoEco. Thanks to qualities like ultra-maneuverability and reasonable price, the device has gained immense popularity in a short amount of time. Contact us at our store to buy Miele Vacuum Bags today.